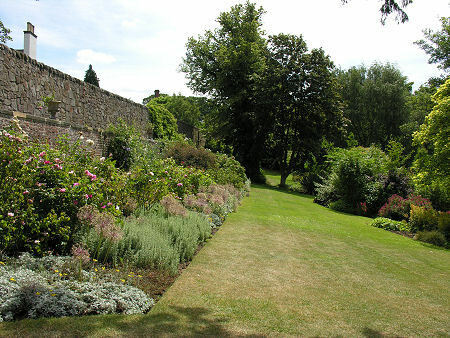 Inveresk Lodge Garden climbs the slope between the east bank of the River Esk and the main road running through Inveresk, a beautiful and exclusive village on the southern side of Musselburgh, which was once home to a Roman fort. Inveresk Lodge itself is NOT open to the public, but it does add a point of focus in the north east corner of the upper garden. We say "upper garden" because this is a garden of two very distinct parts. 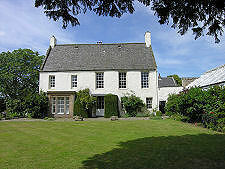 The lower part, in the flat bottom of the valley of the River Esk, comprises open meadow and an attractive pond. Mown walkways lead you around the pond and to other points of interest. 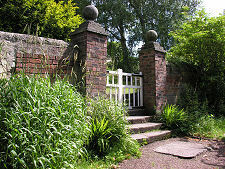 The point of origin for the paths through the meadow is a gateway in the west or lower wall of the upper garden. 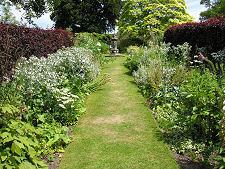 This is a more formal walled garden: and comes under the category of gardens you can enjoy all the more because you know you don't have to look after them. Because the upper garden really does slope quite steeply in places: even keeping the lawns trimmed must present interesting challenges. 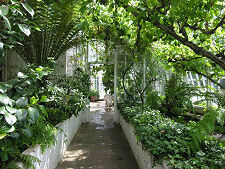 At the very top of the garden, backing onto the stone wall that divides it from the main road beyond, are the superbly restored Edwardian conservatories. These contain a wide selection of the glasshouse plants you'd normally expect including exotic tree ferns: and they also house a series of aviaries. As a result the soundtrack for the gardens adds the calls of parakeets and canaries to the birdsong native to southern Scotland. 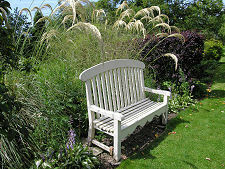 The rest of the upper garden combines traditional herbaceous borders, shrubs and many old roses with a number of unusual plants. The outside of the lower wall, facing over the meadow, is home to one of the most extensive and colourful borders in the garden. 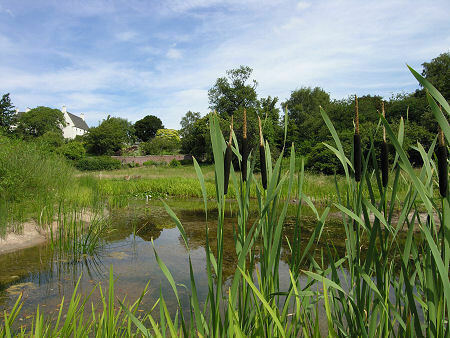 As you wander through Inveresk Lodge Garden it is difficult to believe you are on the edge of a built up area. This really is a remarkable haven, a place to come to forget the cares of the outside world for a while. Inveresk Lodge was completed in 1700. The first resident was Sir Richard Colt, Solicitor-General to King Charles II. It was later purchased by the Wedderburn family and still later the Skirving family. The artist Archibald Skirving died at Inveresk Lodge in 1819. 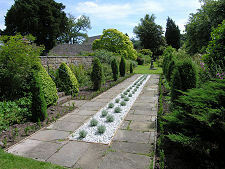 The lodge and garden were gifted to the National Trust for Scotland by Mrs Helen Brunton in 1959 and they have since remained in the care of the NTS.